Acknowledgements The FIS World Snow Day 2014 Final Report would not have been possible without the support of the Event Organisers and the contributions of hundreds of individual participants whose feedback has been invaluable. Thanks are also due to the FIS Member National Ski Associations which promoted the concept and all local and international partners and sponsors for their continued support. 15 15 17 17 20 20 20 21 28 29 33 37 40 45 All smiles for World Snow Day in Ornskoldsvik (SWE) thanks to Alle pa Snow. The 3rd edition of World Snow Day took place on 19th January 2014 and saw 549,000 participants exploring, enjoying and experiencing snow at 610 events held in 35 countries. Children and families enjoyed free or discounted ski and snowboard lessons, lift passes, ski equipment, as well as concerts, races, gifts and prizes, to name just a few of the hundreds of activities. Events took place in cities, on high mountain peaks and everywhere in between. Event Organisers included ski and snowboard resorts, National Ski Associations, private event companies, ski and snowboard clubs, ski and snowboard schools, manufacturers and retailers. The majority of World Snow Day Organisers and participants have expressed a strong interest in participating in the 4th edition of World Snow Day, which will take place on 18th January 2015. 2 Kids, kids and more kids for World Snow Day in Whistler Blackcomb (CAN). Who is the International Ski Federation (FIS) ? As the governing body of international skiing and snowboarding, FIS manages the Olympic disciplines of Alpine Skiing, Cross-Country Skiing, Ski Jumping, Nordic Combined, Freestyle Skiing and Snowboarding, including setting the international competition rules. Through its 115 member nations, more than 6’500 FIS ski and snowboard competitions are staged annually. Specific initiatives are undertaken by FIS to promote snow activities as a healthy leisure recreation, notably for the young. World Snow Day Goals and Analysis Primary Goals: Goal: Enable children and their families to explore, enjoy and experience snow sports through special events and activities organised as part of World Snow Day Achieved? YES. Organisers have staged events to give children access to snow sports. A great example of this was the Apen Bakke in Norway where 72 ski resorts provided free skiing and snowboarding for the general public. Goal: Create global momentum for all people involved in snow activities for a better future by reaching 500,000 participants by the 3rd edition of World Snow Day on 19th January 2014. Achieved? YES. The 3rd edition of World Snow Day saw more than 510,000 participants take part. Secondary Goals: Goal: Increase awareness about the need to protect and conserve the environment. Achieved? YES. Many events included specific environmental awareness programmes at their events. A good example was in Zakopane (POL). The National Forestry Service was invited to stage fun games for children, including a memory game where children had to find the animals and plants. Goal: Promote the health benefits of snow sports to all participants. Achieved? YES. Organisers embraced this goal in different ways. Some showed children the mental health benefits by having fun the snow. Others built Mountains in the City, invited school children, showed them snow sports and then promoted the health benefits. Goal: Emphasise the importance of snow safety and awareness of rules of conduct. Achieved? YES. Throughout Canada, the Canadian Ski Patrol staged a series of safety events for National Safety Week and World Snow Day. These events involved fun safety games such as searching for treasures using avalanche equipment. Similarly in Greece the Parnassos ski area distributed the 10 FIS SnowKidz Rules of Conduct to all participants. 6 Learning about snow safety with some special friends in Hannigalp (SUI). Eurosport, Sanetta and Best of the Alps. 6 Events designed to benefit disadvantaged youth and children. 9 events in major cities around the world. Average of 133.45% growth in social media presence. 1’240 World Snow Day events over three editions. Over 15’000 people reached daily on Facebook. Estimated 32’600 minutes watched on YouTube. More than 141,000 people reached with a single Facebook post. More than 510’000 participants in the 3rd Edition of World Snow Day! 8 These special kids were treated to a full snow experience thanks St. Anton am Arlberg (AUT). World Snow Day by Continent and Country The 3rd Edition of World Snow Day saw 610 events organised in 35 countries. Types of Organisers World Snow Day Events were staged by a wide array of Organisers. The most common were National Ski Associations, with 229 events, representing 37%. This is a 27% increase for National Ski Associations in comparison to last year. Other notable increases came from Event Organising Companies and Ski and Snowboard Schools. It is very positive to see a wider variety of Organisers in comparison to the 2nd edition of World Snow Day. Example Events Sweden: Everyone on snow. 22 ski resorts with free lessons, games and discounted lift passes. Lake Louise, Canada: Free Skiing and Snowboarding for children. Quebec, Canada: Mountain in the City. Whistler, Canada: Children’s Ski Cross race. France: La Fête du Ski et de la Neige. Cortina d’Ampezzo, Italy: Meet and greet with World Cup athletes. Bariloche, Argentina: Free children’s mountain experience. Latvia: Celebrations with games, free lessons and demonstrations throughout the country. Norway: 72 ski resorts with free skiing and snowboarding. Poland: Cross-Country extravaganza as well as free ski and snowboard lessons accross the country. Johannesburg, South Africa: Free indoor ski lessons. Krasnogorsk, Russia: World Snow Day celebration with free games, gifts prizes and parties for families. Wengen, Switzerland: Free lift passes for children. Boreal, USA: Free skiing and snowboarding for children. (21.06.2013) Partnership with Best of the Alps for 3rd Edition of World Snow Day confirmed (20.01.2013) Completion of the 2nd edition of World Snow Day. 435 Organisers 39 countries. (19.01.2014) 3rd Edition of World Snow Day celebrated by 610 Organisers in 35 countries! (01.12.2013) World Snow Day Promotional Trailer launched globally in six languages (15.12.2012) Registration closes. 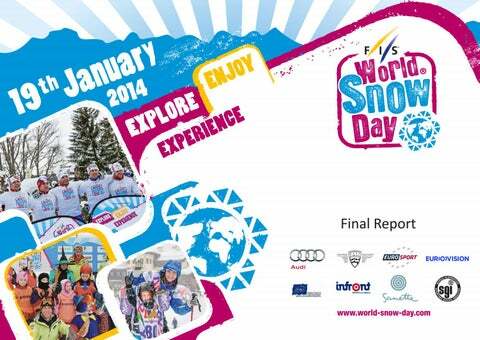 3rd Edition of World Snow Day announced to take place on 18th January 2015. (20.12.2013) Partnership with the European Broadcasting Union for 2nd Edition of World Snow Day announced. (01.01.2014) Virtual World Snow Day launched on FIS website. (20.01.2014) Reporting system for World Snow Day launched. (05.03.2014) Audi signs agreement for Bring Children to the Snow, which includes World Snow Day: Toolkits developed to help Organisers. To communicate World Snow Day, FIS engaged in numerous international level promotional and communication activities. Local communication and promotion activities were created by National Ski Associations and Event Organisers. Presence at FIS World Cup Events From 26th December – 19th January 2014, the World Snow Day brand was featured on the starting bibs of all competitors in FIS World Cup events. Additionally, with many thanks to World Cup Organisers and National Ski Associations, the World Snow Day promotional trailer was shown onsite at races. World Snow Day on TV From 1st December 2013, the third official World Snow Day promotional TV spot was made available in six languages (English, French, German, Italian, Spanish and Russian). Thanks to partnerships with Eurosport, the European Broadcasting Union (EBU) and Infront Sport and media the spot was distributed globally. Broadcasters successfully integrated the spot into programming from the 1st January – 19th January 2014. 15 Taking full advantage of the World Cup at World Snow Day in Cortina d’Ampezzo (ITA). (RIGHT) Thanks to great communication work by Organisers in Britain, an article was placed in the Britains largest newspaper the UK Telegraph. (LEFT) The IOC also got right in on the action. Media Events In conjunction with Sanetta, SportScheck, Garmisch Partenkirchen and the Felix Neureuther Ski Academy, a press event was staged at the newly opened SportScheck flagship store in Munich (GER). The central focus of the event was to spread and reinforce the message of youth in snow sports under the motto “The Future of Snow Sports is Children”. Hosted by German television and radio presenter Markus Othmer, the round table discussion included FIS Council Member and President of the German Ski Association Alfons Hörmann, alpine star Felix Neureuther, Sanetta CEO Dr. Steffen Ammann and Sportscheck Management Spokesperson Stefan Herzog. Social Media World Snow Day’s social media presence has seen exponential growth. Not only has the presence increased on the existing platforms but World Snow Day has also expanded onto a fourth platform. Moreover, Organisers also embraced social media. Facebook pages, Facebook event pages, Instagram accounts and videos all increased the communication of the event. 18 An excellent media event presented by Sanetta, Sportscheck, Garmisch Partenkirchen and World Cup superstar Felix Neurether. Munich (GER). FIS Youth and Children‘s Seminar The 11th FIS Youth and Children’s Seminar was held in Zurich, Switzerland, on the 2nd October 2013. The title of the seminar was “Recruiting and Retaining”. Continuing on from the previous years, international and national organisations were invited to present their efforts to bring children to sports. The Seminar also provided a platform for Nation Ski Associations to present the challenges the face with youth activation. The Youth and Children’s Seminars have continued to grow in attendance with the 11th edition boasting the participation of more than 90 delegates from over 40 National Ski Associations. 17 Richard Branson encouraged people to participate in World Snow Day through his blog. Partner Actions The 3rd Edition of World Snow Day was supported by six exceptional partners: Audi, Sanetta, Eurosport, European Broadcasting Union, Infront Sports & Media and Best of the Alps. The potential of World Snow Day has been substantially enhanced by these partnersâ&#x20AC;&#x2122; excellent participation and cooperation. 25 Warm up time before an exciting day of fun on the snow. Krasnogorsk (RUS). 26 Garmisch Partenkirchen (GER) treated a very special group of kids to a full day of snow sports. 27 Free lessons were the big hit at the Mountain in the City World Snow Day in Quebec/Stoneham (CAN). From 20th January to 20th February 2014, World Snow Day Organisers submitted event reports in the form of text, photos and videos via the World Snow Day Live Profile system. The individual 2014 World Snow Day event reports can be viewed at www.world-snow-day.com. During this period, an online survey was conducted to collect feedback anonymously from the public who attended a World Snow Day event and also those who could not. Feedback from Event Organisers Types of World Snow Day events Overall, there was more variety in events. This is a positive sign as Organisers are catering to different types of snow sport enthusiasts. Based on the information collected, the most popular promotion offered was free ski and snowboard passes (27%). More than 17% of the Organisers provided free gifts and prizes, and 23% offered free ski and snowboard lessons. Do you feel the World Snow Day brand helped you attract participants? 39.6% of World Snow Day Organisers said the World Snow Day brand was very helpful in attracting participants. An additional 50% said the brand was helpful to some degree. Combined, 89.6% of World Snow Day Organisers said the brand was helpful in attracting participants. Do you feel the World Snow Day brand helped attract media attention? 41.7% of World Snow Day Organisers said the World Snow Day brand was very helpful in attracting local media attention. This was in line with the previous edition of World Snow Day. Do you feel the World Snow Day brand helped attract sponsors and partners? 83.4% or World Snow Day Organisers said the World Snow Day brand provided some degree of assistance in attracting sponsors and partners. Do you feel the World Snow Day brand helped motivate your team? 39.6% of World Snow Day Organisers stated that the World Snow Day brand was very helpful in motivating their team. Do you plan to Organise an event for the next edition of World Snow Day (18th January 2015)? 72.9% of World Snow Day Organisers stated they will participate in the 4th edition of World Snow Day. Moreover, an additional 16.7% of World Snow Day Organisers stated that there is a good chance they will participate. Combined this shows 89.6% of Organisers have good motivation to stage an event for next year. This is a 7% increase in motivation in comparison to last year. Feedback from World Snow Day Participants How much did you enjoy your World Snow Day event? From the information obtained, 85% of people who were able to attend a World Snow Day event thoroughly enjoyed themselves. This is a positive increase of 10.7% on the previous year. How did you hear about World Snow Day? 75% of those surveyed said that they were informed about World Snow Day through their local event Organiser. While 45% of participants said they heard about the event in social media. This is a 23.1% increase on last year. Together, these results show the importance of both international communication and local communication. What interests you about World Snow Day? Activities on snow and gathering with family and friends remained the top attractions of World Snow Day events. “Music Shows” and “Meeting Famous People” also saw increased interest from the public. Which special offers attracted you to the events? The majority of participants were most interested in free or discounted lift passes, followed closely by ski and snowboard lessons and food and beverages. These top four remained consistent with last year’s edition. Do you plan to participate in the next edition of World Snow Day (18th January 2015)? Over 85% of participants in World Snow Day events plan to participate in the 4th edition of World Snow Day (18th January 2015). This is a 5% increase on last year and underscores that World Snow Day events were fun and successful. 36 Best day ever at World Snow Day Snow Valley (CAN). High five to that. Feedback from Non-Participants How did you hear about World Snow Day? Interestingly 72.3% non-participants showed that communication from local Event Organisers informed them about World Snow Day. This may have been a combination of event posters, social media communication or word of mouth. This highlights further the importance for local communication from Event Organisers. Why could you not participate in the 3rd Edition of World Snow Day? Feedback from non-participants revealed that the majority of children and families who could not attend a World Snow Day event found snow sports too expensive. Moreover, distance also played an issue. 43.9% of non-participants indicated that they feel snow activities are too far away from their homes. This signifies the importance of making transport options available for events and trying to organise more events in the metropolitan areas. Which activities or promotions would help you to participate in snow sports more? Non-participants indicated that free or discounted lift tickets would be the best promotion to motivate them to participate snow sports. They also indicated better public transport would motivate them further. This provides a solution to the issue of distance, shown in the previous question. Do you think you might participate in the next edition of World Snow Day (18th January 2015)? According to the surveys conducted with the public, it was a positive sign to see that 42.9% of the persons who did not participate in the 3rd edition of World Snow Day would participate in the next edition. 39 Smiles all around during World Snow Day in Shymbulak Ski Resort, Almaty (KAZ). Based on the information and feedback received, FIS has compiled a short list of suggestions for 2015 World Snow Day Organisers. Get your event signed up early Early registration of an event allows for better exposure and allows potential participants to plan ahead. Additionally early registration also increases media attention. 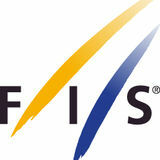 FIS can also present events to interested partners, with September and October being the ideal time. Hint: Registration opens 1st July 2014. Utilise social media The World Snow Day social media platforms are free to use and can have large reach. A good starting point to be Facebook, Twitter and Youtube. It is important to make regular updates on these platforms. Hint: A Facebook event page is a great idea. Speak to local public transport Transport to and from events is vital. Speak to local transport companies to see if a transport agreement can be implemented. These agreements do not necessarily have to be free transport. Discounted transport also goes a long way Hint: If a local company cannot provide transport solutions, see if they are happy to communicate your event with their onboard brochures and posters. 41 37 Copper Mountain (USA) got creative for World Snow Day. The Winter Bike tour was a great hit. Maximize World Snow Day partnerships World Snow Day continues to create strong partnerships. The recent agreement with Audi has seen the development of Toolkits for Organisers to help stage events. These Toolkits are free of charge, will be delivered to the Organisers location and become the property of the Organiser after the event. Hint: Click here to access the application form the Audi World Snow Day Toolkit. Decorate the atmosphere with World Snow Day branding Given the increasing global awareness of World Snow Day, it helps to leverage the identity for an event. Good examples from World Snow Day 2014 included creative use of banners, flags, race bibs, face tattoos, skis, hats, shirts, mascots, and so forth. Many designs and templates for the items listed can be accessed through the online World Snow Day toolkit. Templates are free of charge once registered. Hint: Click here to access the digital World Snow Day Toolkit. Formulate a Plan B Bad weather or transport conditions resulted in the cancellation of several events in 2014. It makes sense to create a contingency plan in case of inclement weather. Some suggestions may include indoor activities or activities. Having a Plan B can eliminate the disappointment of a cancelled event. Hint: Indoor activities are an excellent Plan B. Local school or town halls can be an excellent venue for these activities and relatively cheap to rent. 43 39 Bansko (BUL) really diversified their activities for World Snow Day. 44 39 Creating special memories on World Snow Day. See you for the 4th Edition of World Snow Day on 18th January 2015!